Rowling End & The Mouse House Self-cateringRowling End is a family sized, traditional Lakeland house. 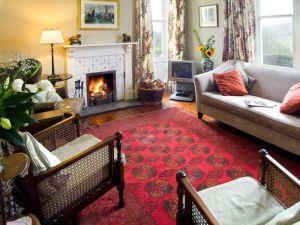 Rowling End House has been lovingly restored and in July 2009 it was awarded a 5-star VisitEngland rating. The understated luxuriousness is complemented by a large farmhouse kitchen with an Aga and open fires in each of the sitting rooms. Rowling end consists of 4 bedrooms, 2 with en suite bathrooms, 2 king-sized doubles and 2 twins. An additional large family bathroom with shower and roll top free standing bath.